UFC President Dana White sets up a photo with two fighters during the weigh-ins on Friday at the Cross Insurance Center in Bangor. Tim Boetsch looks for an opening to land a shot on his opponent Brad Tavares during the UFC fights on Saturday at the Cross Insurance Center in Bangor. BANGOR, Maine — Ultimate Fighting Championship President Dana White brought his mixed martial arts promotion to this small-market city knowing that its economic benefit to his company would be minimal — at best. But that was of secondary importance to the 1987 Hermon High School graduate, who had visited his grandparents in the area every summer while growing up and visits his home in Levant frequently these days. UFC Fight Night 47, held Saturday night at the Cross Insurance Center and televised internationally to fans in 170 countries on Fox Sports 1, attracted a crowd of 5,329 with a live gate of more than $321,000 — both modest numbers by the promotion’s standards with the attendance falling short of a sellout. But while White may not be able to retire based on profits alone from the UFC’s initial foray into Maine, he labeled the event a creative success during a post-fight news conference thanks to enthusiastic fans and a card featuring Ryan Bader’s main-event victory over Ovince Saint Preux and Lincolnville native Tim Boetsch’s come-from-behind second-round technical knockout of Brad Tavares. “I think the people who came here tonight understood how hard it was to get this thing here and what it took to do it, and they were awesome,” said White, who was greeted by chants of “Thank you, Dana,” as he entered the arena just before the start of the 10 p.m. main show. “The fans were great, it was a great night. “The main card absolutely delivered. It was awesome, every fight was great. Every guy came out and fought their hearts out. It was a great night, I couldn’t ask for anything more,” he said. Boetsch’s homecoming fight was the most anticipated event of the evening as evidenced by the applause that greeted the former four-time state wrestling champion from Camden-Rockport High School as he entered the Octagon to the strains of “Cowboy” by Kid Rock. “I definitely had to dial it in just walking out to the cage because the energy was just overwhelming,” said Boetsch, who lives in Pennsylvania but trained for the fight under former UFC contender Marcus Davis at the Team Irish MMA Fitness Academy in Brewer. “Before the fight even started and then once I started to turn the tide a little bit, I could feel the energy, and it was awesome. It was a great opportunity to be fighting this close to home, and finishing the fight the way I did, it definitely feels good,” he said. White had special appreciation for the 33-year-old Boetsch’s effort given their shared Maine roots. “For a guy like Tim to be able at this point of his career to fight in his hometown and pull off what he pulled off [Saturday] night, I know it was really important and special for me, and I know it was for him, too,” said White. White said history suggests that the UFC’s Bangor stop will trigger increased interest in the sport regionally, though he acknowledged that some mixed martial arts infrastructure already has been established since the sport was legalized in the state in 2009. Whether the UFC returns to Bangor or Maine in the future is uncertain. “I don’t know, we’ll see,” said White. “Like I said, the first one didn’t make too much financial sense, and Lorenzo [Fertitta, co-owner of Zuffa LLC, the UFC’s parent company] and everybody on the team supported me that I wanted to come here and do this thing, that no matter what I wanted this fight to happen. “Obviously I’m biased, I’d love to come back here. I’d do it in a second, but it’s going to have to make a little more financial sense for us,” he said. That’s because the UFC is a growth industry in major markets around the world — shows are scheduled next weekend, for example, in Macao, China, and Tulsa, Oklahoma, and among upcoming dates of regional interest are stops at the Foxwoods Resort Casino in Ledyard, Connecticut, on Sept. 5 and at Halifax, Nova Scotia, on Oct. 4. No matter the locale of Tim Boetsch’s next fight, it’s highly likely Marcus Davis will be at his side. Boetsch, the veteran UFC middleweight who scored a second-round technical knockout over Brad Tavares at Fight Night 47, credited the former professional boxer and UFC contender with aiding his striking game during the several weeks he recently spent training at Davis’ Team Irish MMA Fitness Academy facility in Brewer. Davis said some of the training was geared toward using strikes to complement Boetsch’s wrestling-based ground game, though in this case Boetsch’s punching power led directly to victory. “I told him what we needed to do was build on his speed, get his hands moving faster, throwing punches in bunches but varying his levels, and using his hands more to set his takedowns up,” said Davis. “The plan was simple, just go out there and fight like Tim Boetsch, don’t try to mimic any other fighter. 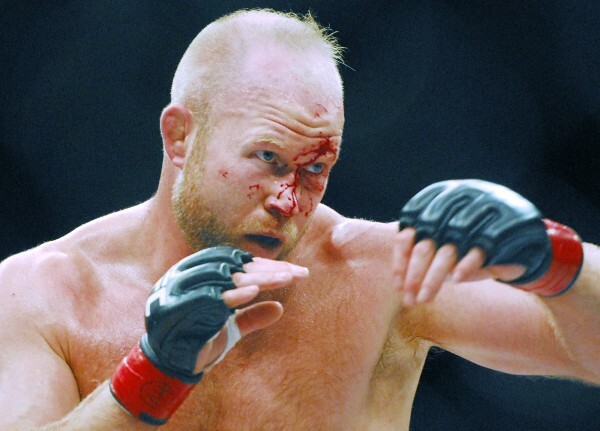 Fight like you fight because that brings individuality into it, and you can’t go find a guy who fights exactly like Tim Boetsch because he doesn’t fit a cookie-cutter style,” he said.